When it comes to the paranormal, there are those who believe and those who say they wouldn’t be swayed even if a poltergeist hit them in the head with solid proof. But I think those who don’t believe in visits from the spirit world just haven’t had an experience yet. My brush with the afterlife came a few months after my grandfather passed away. I had always been very close to him, as I was to all of my grandparents, but my relationship with grandpa was particularly special. We lived in the same small town, and as a child, I loved staying overnight at grandma and grandpa’s house, watching Liberace and “The Wild Kingdom” while eating homemade cookies and hearing about life as it had been on the farm. My grandfather was the first of my four grandparents to pass away. He had suffered from depression through his later years, which was troubling to most of us, but afterward, I realized that we should have done more to help him deal with his illness, and I felt guilty that we hadn’t. After he died, I was running up the stairwell at the local college where I was taking a class. I was totally alone on the steps. Suddenly, I noticed the unmistakable aroma of Copenhagen snuff, a constant companion to my grandpa, who carried with him a Styrofoam spit cup stuffed with paper towels wherever he went. I stopped, felt the absolute warmth of love from this man who had been so special to me, and the scent of snuff slowly dissipated. He visited me again, a few years later, also in a stairway — but this time, at the lakefront newspaper where I covered arts and entertainment. He was only there for a few seconds, but I couldn’t mistake him. I think he chose to reveal himself through that familiar smell because there was not only no way to mistake what it was, but also not much likelihood that someone else was chewing that old-time tobacco. It was like hugs from beyond, and it made me an absolute believer. My husband experienced more tangible contact when he saw the vision that would cement his beliefs. It happened when he was staying overnight at his grandmother’s house, where he slept on a screen porch so he could catch the evening breeze. One night, as he was settling in, he saw illuminated in the moonlight a man wearing a dark coat and hat. My husband watched the man walk past the Screen in front of him and melt into the doorway of his grandmother’s house. Later, after describing him to others, my husband learned that the man he’d seen was the former owner of the property, and was perhaps keeping an eye on what was once his land. Almost everyone has a story, and Danville — the last capitol of the Confederacy and the site of the Wreck of the Old ’97 preserved forever in folk music and passed-down memories — seems destined somehow for legends, ghost stories and reports of paranormal activity. Stories range from a headless ghost wandering Oak Hill Cemetery, trapped like a Washington Irving character in search of a head, to ghosts walking the halls of the Danville Museum of Fine Arts and History. When I was looking for an apartment to rent many years ago, one of the places available was above the museum, though my real estate agent suggested that it might come with a ghost or two. Still, there have been a few alleged reports of paranormal activity, including the aroma of cigar smoke, sightings of fi gures in mirrors and a decorator who had an encounter with a poltergeist who threw an ornament at her while she prepared for an upcoming exhibit. Too, it would be hard to imagine that Maj. William T. Sutherlin was not hanging around during the days of mourning that just wrapped at the museum. The exhibit, which explored Victorian mourning rituals, was held in honor of Sutherlin, who served as a quartermaster during the Civil War. He died on July 22, 1893. But even if ghosts don’t make their home at the museum, there are plenty of other places in the region where paranormal activity has been confirmed by members of the Virginia Investigation of Paranormal Science, a Danville-based group of ghost hunters known for short as GhostVIPS. The organization was founded in 2009, when shows like “Ghost Hunters” sparked an interest, and members have since been involved in several investigations that offered a glimpse into the other side. According to Will Moore, new batteries have been drained, rooms have gone cold, tape recorders have picked up voices and images have been captured on camera at several area sites where either legend or experiences have suggested visits from the afterlife. As in real life, Moore said, some spirits have been chattier than others, but the EVPS — or Electronic Voice Phenomena — that have turned up on recording devices — have been particularly successful in capturing ghostly evidence. At one home, the Doss House, family members had not only experienced doors slamming, lights turning on and off and toys turning on seemingly by themselves, they had also seen their nephew, Michael, walking around in the kitchen, even though he had died several years before. An EVP not only turned up the name “Michael,” but also the words “Anybody home?” which the crew later learned was Michael’s unique way of knocking when he entered his uncle’s home. The VIPS also helped verify a local legend as part of their research. In 2010 and early 2011, the team found themselves at Carter’s tavern, a Halifax County construction with portions dating back to 1773. As the legend goes, one night in the 1800s, two newlyweds were celebrating their nuptials there when another reveler got too close to the bride when he cut in for a dance. The groom was apparently the jealous type, and shot the man dead. It could be, Moore said, that Jack was the jealous husband, and his victim was still at the tavern, eager to tell his tragic tale. And who really knows for sure? It’s a question that will keep the GhostVIPS hunting new cases and the rest of us forever speculating on those stories from the afterlife. Almost everyone has a story, and Danville — the last capitol of the Confederacy and the site of the Wreck of the Old ’97 preserved forever in folk music and passed-down memories — seems destined somehow for legends, ghost stories and reports of paranormal activity. Stories range from a headless ghost wandering Oak Hill Cemetery, trapped like a Washington Irving character in search of a head, to ghosts walking the halls of the Danville Museum of Fine Arts and History. 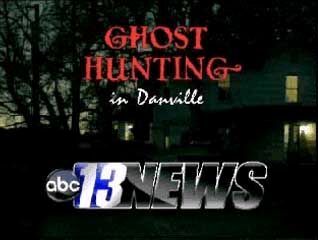 Danville, VA - There's a lot of debate over whether ghosts live among us. But one Southside man he knows they are out there and has proof. Paranormal sciences expert, Max McGregor, searches homes for ghosts and spirits. And he plans to present his findings publicly to the Danville Historical Society next week. McGregor uses several pieces of equipment to track down ghosts and spirits. He says he's found paranormal activity in Danville and Halifax and has spent a lot of time tracking down these spirits. "I've been studying it for six years and I'm getting more and more into it and we are starting to find more stuff as we get into it more," said McGregor. Have you ever wondered if the bump in the night was really a ghost or just apipe in the wall? Is the creak of a floor something walking around, or just the moisture in the air causing it to pop? Is the eerie feeling you have in the basement the presence of something more than normal, or just an overreaction to a story you heard as a little kid? Well wonder no longer, Virginia Investigation of Paranormal Science (VIPS), are the ones to go to if you are interested in what is really going on in your house. Founded in 2009 by Max McGregor and Will Moore, this non-for-profit group uses the most up-to-date technology on the market for parnormal tracking. Their main goal is to provide the client with evidence, recommendations, and allow them to be judge on what they find. In each case VIPS investigates with an open mind, and are always looking for ways occurences can be otherwise explained, rather than paranormal activity. Since their creation the VIPS team has been to over ten different locations in the Danville, Pittsylvania, Oak and Halifax County areas. many of the places they have serviced have been of some historic significance like Carter's Tavern, Oak Ridge Plantation, and the Doss House, but not to limit themselves, they also work in residential homes and businesses. No matter where they are investigating, VIPS comes well prepared for anything. With the most recent technology VIPS can debunk claims and vaildate others. With several equipment cases full of electromagnetic (EMF) meters, laser lights, cameras, Infrared cameras, and much more this group is ready to investigate. The first step before an investigation is research. the founders, McGregor and Moore, always do their fact-finding on the specified area before the investigation begins. Much of this legwork will add to the debunking of certain claims and will aid them while investigating. One of their pieces of technology an EMF meter tracks the spikes of electromagnetic fields in the area. It is supposed that EMF spikes are a sign of an entity. Of course, this can misinterpreted since EMF spikes can also come old exposed wiring. The research prior to the investigation is essential in letting the investigators know what the specific EMF pattern of the building is before they enter. If not, there will be no original base reading from which to go off during the investigation. In one of VIPS investigations of a residential house the owner of the house complained of an eerie feeling in the basement. Before the investigation began McGregor researched the geological background of the area. he soon found out that the home was sitting on a large composite of limestone. The limestone causedusea a high EMF in the basement of the house, which in turn caused the odd feeling. High EMF readings have been found to cause great uneasiness, dizziness, and nausea if someone is exposed for a long period of time. In one of their most memorable cases, Carter's Tavern in Halifax County, VIPS was able to find evidence on several pieces of equipment, from electronic voice phenomenon (EVP) to dark masses in still pictures. while their first visit to the house didn't prove as engaging, their second visit was quite an amazement for VIPS. In L.B. Tayor, Jr's book, The Ghosts of Virginia, vol 2, it is recorded at Carter's Tavern of a lovers quarrel ending in one of the people being shot. While on the investigation the VIPS team asked many questions with regards to the shooting story while documenting with a voice recorder. It is supposed that a voice recorder can pick up the sounds of a paranormal entity speaking even if humans cannot hear the sounds in the moment of the recording. At the time they didn't think anything was happening, but while reviewing the evidence a few days later they were able to EVP's with responses to the questions which were asked. "It is always interesting when we find something that we ourselves can't explain" said McGregor. VIPS plans on braching out even farther than they are now, and reach those in Martinsville, Virginia, as well as the areas they are currently investigating, "We really enjoy what we do, and our main goal is to help others" said Moore. Ghost Hunt - Going to a place were there have been a sighting of ghosts and trying to catch some on film (video and photos), sounds, eyewitness, etc. (graveyards are the number one place to start, churches, schools, and older buildings too). Halifax Co., VA - Do you believe in ghosts? One local organization in Danville does- they're investigators of the paranormal. They say they've seen, heard, and spoken with them. The adventure starts at Carter's Tavern, a Halifax County home built in the late 1700s. Some stories say George Washington stopped there for "refreshments." Two murders allegedly took place on the grounds. And there's a graveyard out back, which is plenty of reason, if spirits do exist, to find them. Inside Carter's Tavern, period pieces fill what is now a home. Visitors get an easy image of how life might have looked back then and what types of souls may exist here. "Several people around in this area think that this house is haunted," said Mark Willard, Historic Preservationist. "We've never had any experiences here, but we've had two sets of paranormal people here and they've had experiences. I've never had one, so I'm a skeptic." But VIPS- or Virginia Investigation of Paranormal Science- thinks this skeptic may be surprised by what they find here. So they bring in the ghost-detecting machines like recording devices, alarms, and special electro-magnetic field readers. "If a spirit walks by, the light'll turn on and that's how we'll know a spirit is here in that sense" explained Max McGregor of one of his ghost-hunting gadgets. And, we're off- ghost hunting if you will. "What's your name?" ask the VIPS members... of any sort of spirit that might be listening. "Did you get shot up here? Who shot you? Was his name Jack?" No audible answers yet, but we know someone was shot and killed here- part of a lover's quarrel. A young newlywed supposedly accepted a dance in the ballroom, with a man who wasn't her husband. Some say blood stains on the floor are evidence of what happened when her husband found them. "Apparently he followed him down and a scuffle happened and a shot rang out and the young man died," said Willard. Later,alarms go off. We're not sure why. Then, one VIPS members sees suspicious lights. Downstairs, investigators say they're talking to a slave child. "Seems to be a little bit of a prankster," said Amy Donahue, of VIPS, about the spirit. "Wants to communicate when it feels to. There are certain things that trigger it. We found that different game playing. Kinda silly, silly things that get its attention." They think reporter Sarah Bloom got the child's attention too- or maybe someone else's. They say there were lots of "orbs" around. They indicate spiritual energy. VIPS asks her to take a role by asking questions on what's called a "k2" or basically a yes-no meter. "I'm Sarah and I'm not going to hurt you," she said to start out, heading into a long series of questions of which like: "Are you here? Will you talk to us? Are you married? Do you want us to leave?" Finally, a trip outside to the grave yard- to visit souls that spent time there long ago. Here, investigators decided on still pictures. They hope what they capture will do the talking for whatever or whoever might be out here. And at the end of the night, our team was still a little skeptical. We saw some strange things, and we were in a very very old home, enough to put anyone on edge a little bit. Friday on ABC 13 News at 6:00, we'll show you what investigators found. Halifax Co., VA - There is plenty of speculation about the afterlife and things that go bump in the night, but do you believe in ghosts or spirits? Thursday, we investigated hauntings at Carter's Tavern, a historic home, with a team of paranormal investigators. Those who do this regularly say they can see, feel, and hear ghosts. Here's some of the evidence...we'll let you decide. Our ghost hunt started in the dark, when we're told electro-magnetic fields-- and thus spirits-- are strongest. Remember the deadly lover's quarrel that supposedly took place here at Carter's Tavern? Our VIPS -- or Virginia Investigation of Paranormal Science -- wanted to know more. When they felt like they had encountered a spirit, they started asking questions. "Will asked, 'Who shot you?' and in this section right here, we got the EVP saying 'It won't Jack!' said Max McGregor, with VIPS. We asked if there was anyone near him at the time. "No, he was the only one upstairs." said McGregor. The exchange continued during the investigation. "Why did Jack shoot you? Who's Jack?" "And right here is an answer." said McGregor. It was outside the steps. "Well who shot him?" "bleep Betty"
"We got two names. The last name sounds like Betty but we can't figure out what the first name is despite all our efforts," said McGregor. We also took a look at my attempt to communicate with a spirit. "Do you want us to leave?" We had asked. "Now, right here you hear the word "stay". It's very faint but if you listen closely you can hear it." said McGregor, pointing at the audio. During the investigation, we also invited whoever may be out there to talk to us. "Will you talk to us?" we asked. "And right here it's saying, "no"." said McGregor. "Now, if you highlight all of this it's hard to understand and I don't really know what it's saying but it sounds like it's saying "are you deaf? Or did you do that?" And remember those pictures we took in the home and out in the graveyard? "If you look right here, you see a face outlined on the wall," said McGregor. Could that be a shadow of anything else or is that? "It could be," said McGregor. "But there's nothing else in the room that would make that type of shadow." "Is it common to see faces like this when you go back and look at film?" we asked. Plus, we found unexplained lines in the sky above these graves. "There is no lights in the sky at the times we took the pictures. Most people just describe that as collections of energy," said McGregor. "So, a ghost?" we asked. "I wouldn't really explain it as a ghost. It's just energy in the sky that can't be explained," he replied. The homeowners at Carter's Tavern say they can't be convinced of the existence of ghosts-- they think all the noises are probably just the result of living in an old house near the woods. We do want to know what you think -- is this enough to prove something paranormal is going on at Carter's Tavern? Pittsylvania Co., VA - When the sun goes down do you ever wonder about the strange noises you hear? Maybe you wonder if that shadow in the corner of your eye is something-- supernatural? In Southern Virginia, VIPS, or Virginia Investigation of Paranormal Science, will tell you who or what may exist in your home. We sent Sarah Bloom to a historic Pittsylvania County home with reports of hauntings to see how it all works. "We have heard it sounds like people are talking and nobody's there," said Sonja Ingram, a homeowner and historic preservationist. "Maybe 3 or 4 or 5 people just sorta having a conversation." Sonja Ingram says the sound is so distinct, sometimes her family will go outside to see who's there...and find no one. Others who have rented the home claim to have seen a light switch go up and down. "They think they heard was a child crying or talking or something like that," said Ingram. "They also reportedly saw a ghost cat, like an apparition of the cat that they would see on the stairway." Enter VIPS- ready to study what spirits here might do or say. "A cool breeze that goes by you, a smell that isn't in the home, smell of flowers, things along these lines. Then you can have a touch that you normally wouldn't get. All the way up to a push, a shove, hair pulling," said Amy Donahue with VIPS. But most often, these spirit communicators say it's just a conversation.
" I also have a ball on the floor," said Donahue. "If someone would even want to touch the ball, make the ball roll, you can do that to let us know that you're around." Here's what happened when we went back to the audio recording of that evening. Tape : "I also have a ball on the floor. If somebody would want to even touch the ball, make the ball roll, if you want to." "Now, right here you hear a voice that says "ball roll". I'm gonna take that to a new screen for you. Right here it's saying roll," said Max McGregor of VIPS. We kept talking that night, with some success on our yes-no meter. "If you don't want to talk, that's fine. Just give us a signal that you're here," said Donahue. "Are you male? Is there more than one of you?" We even ventured out to a pet cemetery in the front yard, hoping that might start up a conversation. But at the end of the experience, we only came away with one other strong audio recording. "Now right here it sounds like it's saying help, but very hard to understand," said McGregor. It's kind a like a loud whisper. Actually, I was wrong. it sounds like it's saying get out...or help...could be either one. "I've never felt threatened or afraid by it," said Ingram. "I think it's kind of interesting and if there is some you know, if there is some paranormal activity in the house it would be interesting for me to find out who is it?" And while these sessions may not always come with a lot of feedback.For its participants, it's a started conversation....if you believe it, anyway. If you’re wondering about those weird sounds in the night or odd shapes in the dark corners of your home, look no further. Danville has its own ghost hunters — they call themselves Virginia Investigation of Paranormal Science, or VIPS. President Max McGregor and vice president Will Moore started the group in January and have investigated two homes in Pittsylvania County for supernatural activity so far this year. McGregor said he understands those skeptical of what he’s doing. About three years ago, he didn’t think spirits existed, either. But after watching TV shows on haunted houses and ghost hunting, he became a true believer and VIPS was born. The nonprofit group includes 13 members and offers its services free of charge. McGregor said he makes no money from his full-time hobby/vocation and the organization operates on donations that pay for its equipment. Ghost-hunting tools include digital video and audio recorders, digital cameras and electromagnetic field detectors. Investigators also use a laser grid that shoots beams all over a room. If the lasers break, McGregor attributes it to paranormal activity. The home’s lights are turned off and appliances are unplugged during investigations since they give off electromagnetic fields. An investigation can take from two to four hours, depending on the home’s size, McGregor said. Three teams of two people each cover different sections of the home, swapping rooms to determine if they all find the same phenomena, McGregor said. VIPS’ investigators will write up a report and review the findings with their clients. Sonja Ingram, a VIPS member and a field representative for Historic Preservation Virginia, would like to tie the group’s activities with historic preservation, since reports of hauntings typically come from old homes. “It would be a way for younger people to get involved in preservation,” Ingram said. The group investigated Ingram’s 1920s-built farm house in Keeling in March. VIPS also combed the Oak Ridge home, built in 1835 and located on Berry Hill Road, for paranormal activity a few weeks ago. Ghosts, or non-human body life forms, emit an electromagnetic field (EMF), McGregor said. A person experiencing ghosts in their home may feel nausea, fatigue, sudden temperature drops in the air or a feeling of being watched, he said. Ghosts cannot be seen or heard by most people but VIPS’ equipment will detect imperceptible sights and sounds, McGregor said. Some people may be more sensitive and be able to see or hear ghosts, he said. Typical hauntings are nothing to be frightened about, he added. “The only time someone should really be afraid is if the spirit is really disrupting their life, if it’s scaring a child,” McGregor said. About 90 percent of reported hauntings “are not what you would call aggressive,” he said. “Most of the time, they (ghosts) have some sort of connection to the house or to someone who lives in the house,” he said. VIPS vice president Moore said people may request their services to find out of a spirit could be an ancestor or to communicate. The experience can give the client reassurance that there is nothing to be afraid of, Moore said. The group investigated Ingram’s home because visitors have said they have observed odd occurrences in her home — such as the bathroom light switch moving up and down. Ingram said she has heard people talking in her home even though it is far from the highway. Previous owners said they heard a child crying or a ghostly cat on the stairs. VIPS’ report noted a “heavy feeling” in one room that moved into the master bedroom. Equipment also picked up four “EVPs” — electronic voice phenomenon — and two EMF spikes. Membership in VIPS also enables Ingram to indulge a passion of hers — exploring historic homes. Elaine Lenk, who lives in the Oak Ridge home with her husband, Bob, said the group investigated their house a couple of weeks ago after an arrangement through a mutual friend. Lenk said they are skeptics and have not seen or heard ghostly activity in their home. The Lenks are awaiting VIPS’ results and will listen to what the investigators have to say, Elaine said Friday. McGregor said he has no argument with those who don’t believe in ghosts. “I just wish people would have a more open mind to it,” he said. Halloween might be past, but things go bump in the night year-round. McGregor is president and co-founder of Virginia Investigation of Paranormal Science, an organization in Danville that investigates local paranormal encounters free of charge. Why are people so intrigued by paranormal activity? Mystery of the unknown, I think. People not knowing why they're here, where they come from or something like that. It's just mystery of the unknown ... and we try to make people understand it as much as possible. Talk about one of your creepiest cases. The house belonged to one of our investigators that's been haunted for years. There was a spirit of a little boy in there and there was also a spirit of an animal. We didn't catch the spirit of the animal, but we caught a voice. Someone asked, "Are you the one telling the little boy not to talk?" and this really deep, raspy voice answered, "No." And there were a couple other sounds in that investigation. There was also a sound -- it sounded like glass breaking. We had one voice that said "listen" and there was a real loud screech afterwards. ... We did not hear [this] with our ears. It was all captured on a digital recorder. What are some haunted places in Virginia? Most houses in downtown [Danville] that have been there for 100 years are haunted. The arts museum in Danville is haunted. ... Sutherland Mansion, which is actually the fine arts center now, is haunted, and there's a street down the road from us that [has] a lot of old plantations on it and those are also haunted. What are some tips to getting rid of paranormal activity?